What a mighty God we serve! It is my high privilege to serve Him in this place. I look forward to what He will choose to do through this congregation as we seek His will and follow it closely. I spent the largest portion of my childhood & teenage years in Tecumseh, OK. I graduated from Tecumseh High School before continuing my education at Oklahoma Baptist University. I received my Bachelors in Instrumental Education K-12 in 1979 from OBU. I continued my studies at Southwestern Baptist Theological Seminary at the satellite campus on OBU until I received my Master of Divinity in 1987. I was licensed to preach in 1976 by Sharon Baptist Church in Shawnee, OK and was ordained to the ministry in 1978 by Rock Creek Baptist Church of Shawnee, OK. I met my wife, Althea, at Rock Creek Baptist Church while serving as Associate Pastor of Children & Bus Ministry. We were married in June 1978. We have been blessed with three sons, Garrett, Cody, & Josh. Garrett met Rebekah at RCBC and they married in 2001. Cody & Debbie were married in 2009 in a home ceremony. Josh met Carina at boarding school in Malaysia and they were married in Thailand in 2003 (with an Oklahoma home ceremony after we all returned here). Althea & I have been gifted with nine grandchildren (one that lives with Jesus) that we enjoy spending time with weekly. 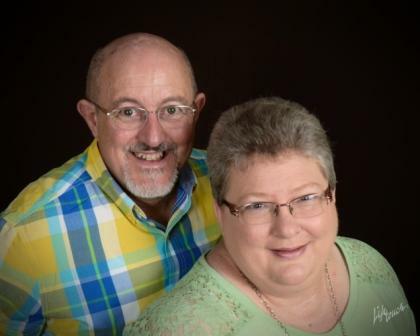 I served as a pastor in Warwick, Seminole, & Warner (all Oklahoma churches) before Althea & I served as missionaries with the International Mission Board in South Asia for 15 years. We’re always willing to share about our service to the Lord overseas to anyone that wants to listen. Since returning to Oklahoma in 2004 I have served as pastor at a church in McLoud and music minister at a church in Shawnee. Those were part-time positions as I worked in a secular job so that we could live near our parents as we felt led by God. We are both excited to be serving at RCBC again with people we have loved & have supported us through the years and with folks that are new in our lives. I hope that all of you will take the opportunity to get to know Althea & I and that we will have joy in serving together. Just how did I end up as Pastor of Rock Creek Baptist Church? It started about 60 years ago! My mother tells me that I first attended church at 3 weeks of age (to be honest I don’t remember what was taught on that day!). My Mother took me to church regularly and later when my Dad became a follower of Christ we went together as a family. As a child and young person I was at church almost any time the doors were opened—Sunday Morning, Sunday evening, Wednesday night, revival, any time. I could answer all the questions that teachers would ask about the well known Bible Stories. I tried to live a good life and do things that would please God. But……deep down I knew that something was missing. Something wasn’t right. I just could not live up to the 10 commandments. I thought I needed to “rededicate” my life and did several times. I felt better for a while afterward but would fail again. At the age of 14 on a Wednesday night, I asked the youth director how to know if you were “saved” or right with God. After visiting I simply knelt down and said a prayer. I told the Lord that I had tried to live a life that pleased Him but could not. I needed His forgiveness and help. I wanted to trust Jesus and what He did for me by living a perfect life, dying on the cross, and rising again. I wanted Jesus to lead my life and I was willing to follow. I didn’t hear angelic songs, see heavenly visions, or anything. but I knew that the Lord heard my prayer (Romans 3:23, 6:23, 10:9-10, 13). At 14 I was a “baby” in Christ. That Wednesday night started a journey of learning what it means for Jesus to be Lord (boss) and me the follower. No fault with His leading but I am sure glad He is patient with my following (which is less than perfect). Following Jesus as Lord has led me to pastor churches, lead worship through music in churches, our family leaving America and going half way around the world to serve Him and others. Following Jesus has caused me to surrender “my way” of thinking and doing things for His better way. Has following Jesus been easy with no difficulties? Not at all. Just because we are followers of Christ we are not exempt from the problems/difficulties of life. Has following Jesus been worth it? Absolutely. I cannot imagine going through life without His guidance, strength, and help. Who or what is directing your life? If it is anyone other than Jesus, you are being short changed. Please, consider Jesus!